In the approach to Christmas, it seemed time to make another dark beer. Last year’s Christmas Ale was an interesting experiment, but the spicing was a little odd so this year I decided to make something a little more conventional and that smelt slightly less like Dr. Pepper. 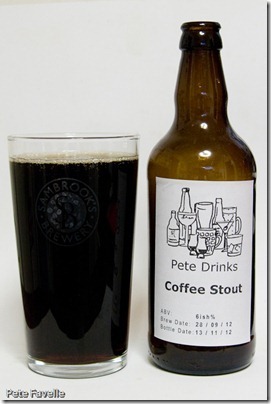 However, as it’s boring to make something too conventional I thought I’d try a common variation and make a coffee stout. The stout element was pretty simple to devise. I’ve built up quite a collection of malts recently, including some brown malt from our visit to Harbour and quickly put together a recipe. I kept the black malt to a minimum, as I wanted the colouring without getting the bitter flavours it can introduce. The coffee side of things was trickier. The internet was of no use, as the advice ran all the way from “2 oz per 5 gallon batch is far too much”, to “you need at least 6 oz per gallon to be able to taste it”. In the end I went for 100 grams (around 4 oz) of freshly ground coffee, based on nothing more than that 100 is a nice round number. The advice on how to add it was equally bewildering. Some people add it at the start of the boil, which seemed to risk extracting far too much bitterness from the coffee. Randy Mosher suggests a cold extract, soaking the grounds in cold water for 24 hours. Sounds too much like hard work to me, so instead I settled on adding some coarsely ground beans once the boil is finished, in a late-hopping manner. When it came to the brew day, I discovered why I always buy my grain pre-crushed. The brown malt kindly given by Harbour wasn’t crushed so I had to do it by hand. This involved putting it in a large bag and rolling it with a rolling pin for about six hours until it looked about the right consistency. Ok, so it might not have been six hours, but it felt like it. At this stage, I discovered another rule of homebrewing. Don’t start brewing without double-checking your ingredient cupboard. The water was already heating when I discovered that despite having a recipe calling for 650 grams of amber malt, there were only about 230 grams in the box. I closed my eyes and threw in some crystal malt to make up the balance, crossed my fingers and brewed anyway. Aside from the brief ingredients crisis, things started pretty smoothly. After the boil, I had hoped that the hop bed would filter out most of the coffee grounds, but quite a lot managed to make it into the fermenter. Happily, it didn’t seem to cause any lasting harm. It was also at this stage that I carefully took a gravity reading and utterly failed to write it down, which is why the bottles are labelled with a rather vague strength of “6ish % ABV”. After a week in the fermenter, I transferred the beer to my trusty barrel where it sat for 5 weeks or so. Beer seems to be much happier once it’s had a few weeks to mature and I was in Japan for most of that time. When it came to bottling, for the first time I batch primed. In the past I’ve added half a teaspoon of sugar to each bottle before filling it, but that’s just one more hassle during what is already the most tedious part of homebrewing. This time, I dissolved 2/3rds of a cup of sugar in a little water, and added it to the whole batch in one go. Obviously the bottling process yielded ample opportunity to check progress, and very tasty it was too. It’s been an impatient few weeks, but it’s now nicely conditioned and ready to be enjoyed. The colour is wonderful – so dark a reddish brown that it appears almost black. The head has a nice tan colour and leaves a pleasingly lingering foam. The nose is very heavy on coffee, but it’s sweet and creamy too – more like a latte than an espresso. There’s a subtle, blackberry-like fruitiness and just a hint of alcohol. 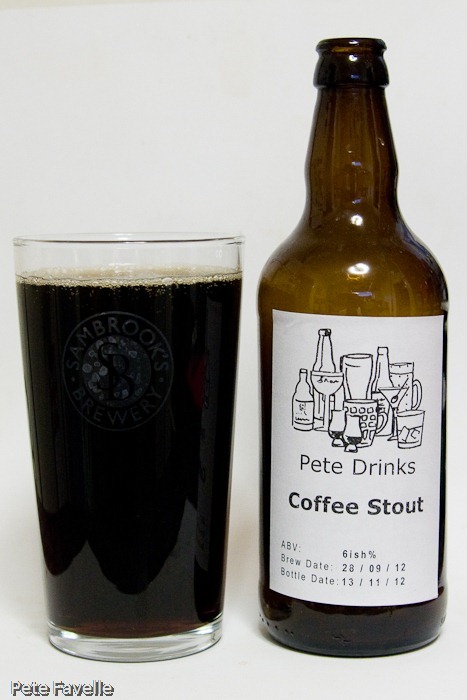 In the mouth, the coffee is more controlled – still there, but now blended nicely with a rich, slightly creamy and medium bodied beer. Sweet at the start, but with a slowly growing background of coffee bitterness, it has a pleasant, gently warming alcohol kick to it as well. Overall, it’s a tasty coffee stout and I’m very pleased that it turned out pretty close to how I intended. The coffee level, which was a complete stab in the dark, seems to be just about perfect. 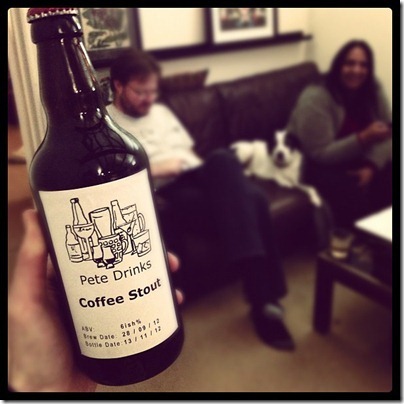 Fundamentally, if I’d have bought this in a shop rather than brewed it myself, I’d have been a pretty happy customer. As with many homebrewers who would happily give up the day job if only someone would give me a brewery, that’s all I can ask! Once again, many thanks to Monica Shaw for the excellent picture at the top of the post, and the nice comments about the beer!